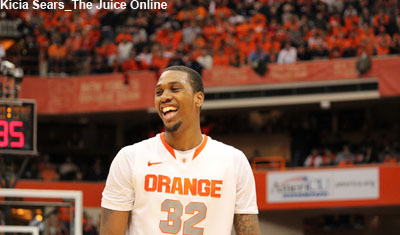 Syracuse forward James Southerland laughs in a game against Louisville. Mandatory Photo Credit: Kicia Sears, The Juice Online. 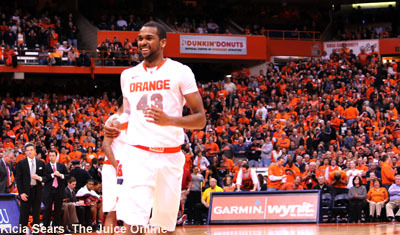 Boeheim’s Army forward and Syracuse legend James Southerland calls in to discuss the team’s chase for The Basketball Tournament’s championship and his time at Syracuse with host Wes Cheng. The Juice Online’s Brad Bierman then calls in to discuss ACC Football Media Day. Wes Cheng: What is your favorite memory from your playing career? James Southerland: I would say making it to the Big East Finals and also making it to the Final Four because it hadn’t happened in six years. I got to showcase my talents there. WC: What advice would you offer the freshmen and what do you think of the 2018-19 team overall? 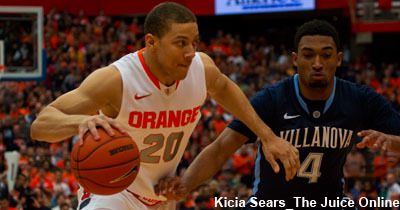 JS: I love Elijah Hughes. I feel like he’s a guy that everyone’s going to be noticing. He’s got a lot of fire. This team kind of reminds me oft he teams that we were on when they were loaded with talent. I just want all of those guys to stay focused, stay consistent. There are always going to be ups and downs. But as long as you stay consistent, they’ll be better off. 7. How good does 2018 look?